Sage is a perennial plant with leaves which leave a lasting impression. I'm sure you have seen food TV shows extolling the virtues and the exquisite aroma of this savory herb. Well, it just happens to be true. While used mostly in cuisine, sage not only tastes good it may also have medicinal qualities. 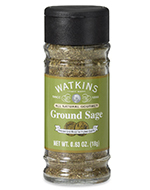 For culinary use Watkins sage goes well with fish, sausages, chicken and turkey. Sage also pairs well with cheese and complements potato dishes as well as split-pea and bean soups, and should be added near the end of cooking so as not to give too strong a flavor. Watkins offers you pure sage and poultry seasoning, a savory combination of our premium-quality herbs which is specially blended to complement any poultry dish. Especially superb for stuffing poultry seasoning also makes an excellent spicy sausage seasoning when combined with Watkins Pepper. 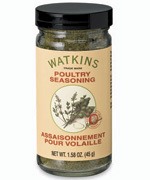 Add to any chicken or turkey dish, or use as a rub for roasting. You can shop for Watkins sage, poultry seasoning and other natural products in our safe, secure Watkins US store, or our Watkins Canadian store or request your free Watkins full product catalog and order by mail or phone. Used for thousands of years medicinally sage has been used to aid in swelling; sprains; ulcers, and bleeding. Utilized in tea, sage helps with sore throats and coughs. It also treats inflammation of the mouth and gums. Sage has been promoted by herbalists in the treatment of rheumatism, menstrual bleeding, improving the nervous system, and honing one's senses. Sage contains camphor and phenolic acids, both of which are antibacterial. It also contains thujone, an antiseptic, and tannins, which have astringent properties. Studies also reveal that the ingredient in sage oil may act as antibacterial, antifungal, and antiviral treatments. Most notably, however, sage does reduce perspiration. Watkins Aloe and Green Tea Deodorant's unique aluminum-free formula uses coriander and sage extracts to help tighten pores and eliminate body odor without the irritation and drying of antiperspirant products. Try sage as a remedy for sores in the mouth and for sore throats. Known to have compounds which help kill bacteria, sage can function in the treatment of gingivitis; canker sores; bleeding gums; tonsillitis and, laryngitis. Recommendations to soothe sore throats and laryngitis include gargling with sage by boiling it in water; strain after ten minutes, and let it become tepid. Tea sage can also be used as a mouthwash. To make sage tea, use one to two teaspoons of dried leaves per cup of boiling water; steep for ten minutes; then strain. Sage has long been used to treat gastrointestinal disorders. It relaxes muscle spasms in the digestive tract, and has been used in the treatment of indigestion. It may also reduces blood sugar levels in individuals who have diabetes. Very few side effects have been reported from the consumption of sage leaves; however, * sage should be used in medicinal amounts only in consultation with your doctor or health care professional. You'll enjoy the most benefits, the best flavor and save money when you use a high quality herb. With Watkins you'll receive only the very best quality available. Purchase Watkins sage, poultry seasoning, deodorant and other natural products in our safe, secure Watkins US store, or our Watkins Canadian store or request your free Watkins full product catalog and order by mail or phone.